Did I mention I love this template? 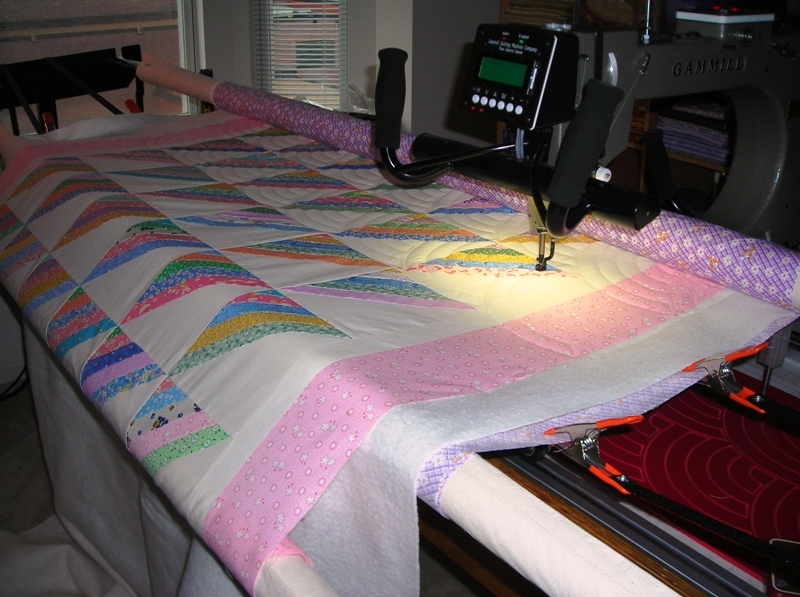 I’m quilting another HeartStrings top today – this is a quilt that I designed in EQ and cut out for my Mom. She pieced the top and gave it to me to quilt and donate. Look at how nice and flat that border lies unlike the one I just finished quilting for my aunt! The skies have gotten dark and the rain is pouring down. I’m going to unplug the Gammill for a bit since I noticed we have a tornado warning in effect. Don’t want any lightening strikes or power surges to mess up my machine. ‹ PreviousDid I sound like I was complaining? Just heard there was a possible tornado touchdown in your area. Hope things are ok. Check in when you can. I hope the warning passes with no tornadoes! The Baptist Fan is still my favorite too…it looks great on everything! I bought the Baptist Fan QuiltEZ template at MQX this year – I can’t wait to use it! The Baptist Fan remains my favorite too! Kudos to your mother for her piecing skills! Every piecer should do borders as flat as this! I don’t have a LA, but I bought two different size baptist fan stencils in Paducah last month. I love the way they look on your finished quilts. Of course, by hand, mine will take a tad bit longer to do.